Newly hatched chicks require a lot of care in their first weeks of life. Acting as the mother hen, you need to monitor these young birds, checking on the brood at least five times each day for the first month. Food, water and housing are just a few of the components necessary to raise healthy and happy chicks. Local farm stores offer newly hatched, day-old chicks as well as fertilized eggs that you can bring home to hatch using an incubator. Make sure waste is not stuck to their vents and that you will not be purchasing any sickly chicks. Bear in mind that having a businesses mail you day-old chicks is a dangerous practice best avoided as the chicks can die from the stress of transportation. Depending on the number of chicks you acquire, you can temporarily house them in a large cardboard box, glass aquarium, plastic tub or children's wading pool. 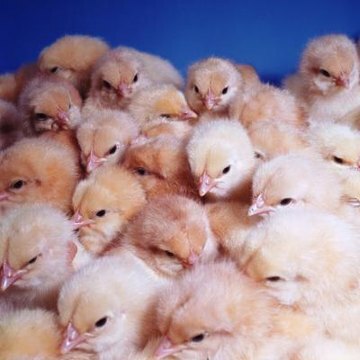 Allow for a minimum of 6 square inches per chick to start, and increase the space when they reach 4 weeks of age to 1 to 2 square feet per chick. A wire roof on the housing provides both ventilation and safety from escape. Place the brooder in the basement, garage or spare room, where you do not mind a messy area. A heat lamp, discussed below, will keep them warm. However, the room should be free from drafts and predators, including eager children and curious household pets. Only when the chicks reach 2 or 3 weeks of age can you take them outside for short periods of time to acclimate them with the weather outdoors. Once adult feathers begin to grow in at 5 or 6 weeks, the chickens can be transferred to an outdoor coop. If you prefer to keep your chicken indoors, you need to consider chicken diapers to prevent messes and how to protect your chicks from other pets. Just like human babies, chicks need to be kept warm. This is achieved with a 250-watt heating lamp that can be moved closer to or further away from the floor of the brooder to adjust the temperature. Consider using a red bulb to allow the chicks to sleep and reduce pecking in the flock. Upon hatching, keep it at 95 degrees and decrease the temperature by 5 degrees each week until you reach 70 degrees. In addition to using a thermometer, look at the chicks' behavior to determine if the temperature needs to change. For example, chicks huddling under the light are cold and those keeping strictly to the shaded areas, avoiding the heat lamp, are too hot. The bedding materials absorb waste and allow the chicks to naturally scratch around as they would do outside to find bugs. Spread pine shavings about an inch deep. Never use cedar shavings as this can cause respiratory problems, nor newspapers which are not absorbent enough. Depending on how messy your chicks become, you will need to change the bedding at least once a week until they are moved to a larger coop. Chicks do not get meals. They need access to food and water at all times, with the feeder and waterer kept away from the heat lamp. Begin with a specially formulated starter or starter/grower feed in a chick feeder until they reach eight weeks of age. You only need to use medicated feed if the chicks have not been vaccinated against Coccidiosis, a parasidic disease affecting the intestines. A chick waterer allows many chicks to drink without drowning as they can in dishes of water. Introduce your chicks to the waterer by dipping the tip of the beak in so they can find it later. The waterer can get quite dirty from the chicks kicking bedding around and so it will need to be changed a few times each day. You can cut down on the messes by raising the feeder and waterer up off the floor of the brooder when the chicks are two weeks old. Furthermore, as chickens do not have teeth, they swallow small pebbles to store in their crop to grind up food. For this reason, provide the chicks a small cup of sand or bird gravel starting at three days old. Chickens love to roost and so you can encourage this behavior by providing a roosting pole in the brooder, about 5 inches off the floor. This prevents the chicks from trying to roost on the feeder or waterer. Treats are an option, from bugs to vegetables, but should be given very sparingly. Maintain a sanitary environment at all times by washing your hands before and after handling your chicks.